Nail art is extremely popular these days and women of all ages, fashion sensibilities and backgrounds indulge in it. Here are some simple and easy ways to decorate your nails at home. When not using these supplies and tools to decorate nails, it is best to store them in a shoe box or a vanity kit. Opaque polishes work best for nail art. If you are the types who like to decorate nails every now and then, you must grow your nail polish collection by keeping a variety of opaque and highly pigmented polishes. Choose a workplace where there is plenty of light and air. Make sure you protect the surface from polishes, stains and spills. A flat table surface covered with a waxy paper works best. Arrange everything you need on the table so as to avoid getting up now and then. Avoid a messy work-surface as that could lead to messy nails or even mess on the hands. Nail preparation can range from simple to complex such as getting a professional manicure at the salon. In any case, it is essential to remove the old nail polish coat. You can also do a DIY manicure at home by soaking hands in hot water, scrubbing them with a brush and washcloth and removing hardened calluses and cuticles. You can also clip your nails to a desired length at this point. Using a quality nail-paint remover, remove the old nail polish completely. This is important to ensure that the new art work sticks well and lasts longer. After you have dried your hands, apply the base coat. Once the clear or colored base coat has dried, you are ready to being decorating your nails. Nail art brush such as the Nailschic is one of the easiest way to decorate nails. The brush consists of pen cap, pen cleaner, tip, brush applicator, squeeze bottle etc which allow you to create hundreds of cool patterns, designs and styles to suit different personalities- the possibilities are endless with Nailschic brush applicator. The key is to get a base coat, then brush on the design layer, and pen on the finer details on the design. It is as simple as 1-2-3! In order for the nailschic pen to work properly, be sure to clean its tip regularly. Dip the pen tip in nail polish remover varnish for a few minutes then place the pen cleaning cap on it to remove excess buildup and residue. After the base polish is dry, use the brush tip and pen tips to create cool designs on the nails. You can also do numerous touchups as you like-just make sure you let the base coat dry completely. The simplest way to decorate nails is to use simpler designs first: flowers, spirals, lady bugs, stripes, watermelon seeds, flag of USA, paw prints etc are the coolest and simplest ideas to decorate the nails. Later, as you get better with using the nailschic brush, you can go for more complex designs like fruits, hearts, panda bear, stars, scenery etc. Marble nail art– This is a popular way to decorate nails. It uses a darker base coat and has designs made with lighter or pastel shades that really pop out against the dark background. You can use marble nail art to decorate just the thumb nail and use other easy ways to decorate the remaining nails. Alternatively, you can use the same style to decorate all the nails. Glitter– Glitter is ideal for short nails and you can create hundreds of patterns with it. Glitter nail art is particularly popular with brides-to-be looking for easy ways to decorate nails before the big day. Floral designs with rhinestones- How cute will tiny flowers look on the nails with a beautiful light background and darker colors to pop out the rhinestone centers? Mix and match- Gone are the days when all nails have to have the same design. You can use different ideas for each nail-just make sure there is a common theme to bring about a cohesive look for the nails. Dress your nails for the occasion– Looking for ways to decorate nails for an event? Then why not use colors apt for that particular event? For example, in summers you could dress your nails to match the beach-white, blue and yellow will be great colors to use then. In the Holiday season, you could use green and red to represent the colors of Christmas. 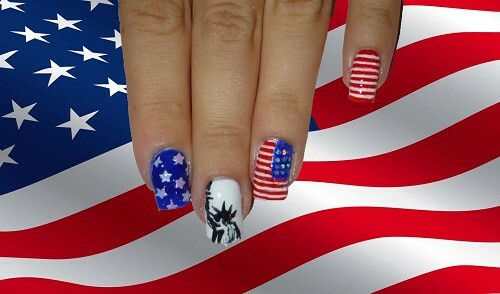 On Memorial Day, Veterans Day or Independence Day, you can decorate your nails with red, white and blue. Represent your passion through nail art- If your workplace allows it, you can even represent your passion, hobbies etc through your nail art. For example, someone working as a nurse or doctor or in a clinic or hospital can draw a red cross against a light/white background. Use basic shapes– Shapes like stars, cross, hearts and stripes are easiest to use in designs for the nail art. You can keep things elegant and simple by having transparent base coat and use darker colors like red or black to draw the shapes you love. 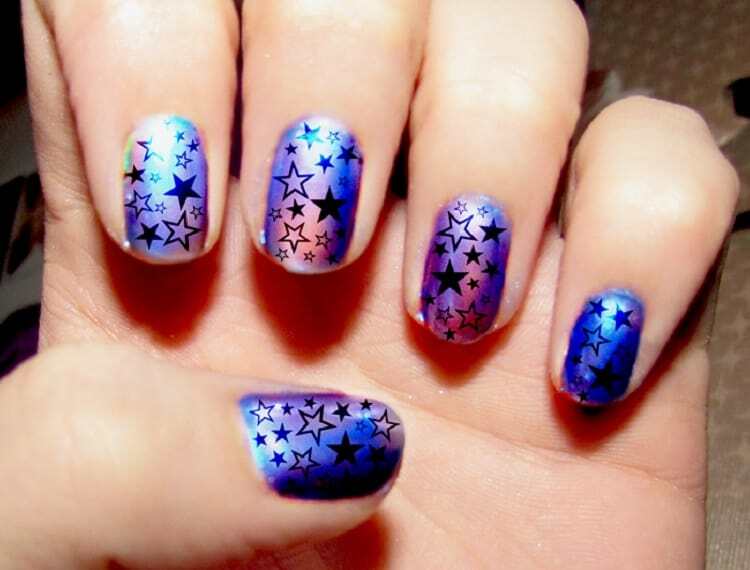 An example of star based nail art is shown above. Segmented nail art– Another easy way to decorate nails is to draw segments on the nails using same, similar or even different colors. A fine brush, toothpick or the nailschic pen can help you achieve it easily. 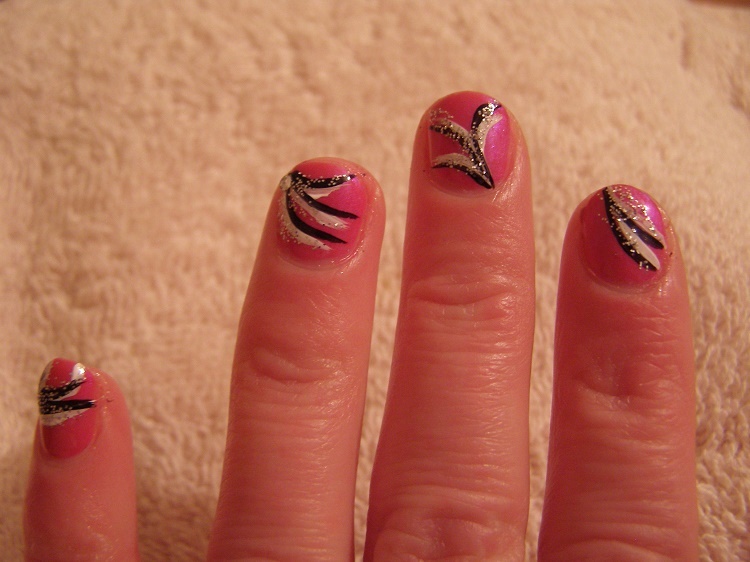 Animal prints- Animal prints like tiger or leopard print can be very easily achieved on nails. A single coat of transparent nail polish followed with black colored polish to draw the prints is all you need! Dress up the nails for a party- If you are a young girl going for a party, then use bright fluorescent colors to dress your nails up. Gemstones and feathers– Using emerald or jewel tones in nail polish can help you achieve wonders in nail art. You can also use feather and other embellishments for the art work. Likewise, you can use color shading effects to get 3D effects on the nails. Use only black and white– Just using two colors- black and white can help you achieve numerous dazzling effects in nail art. 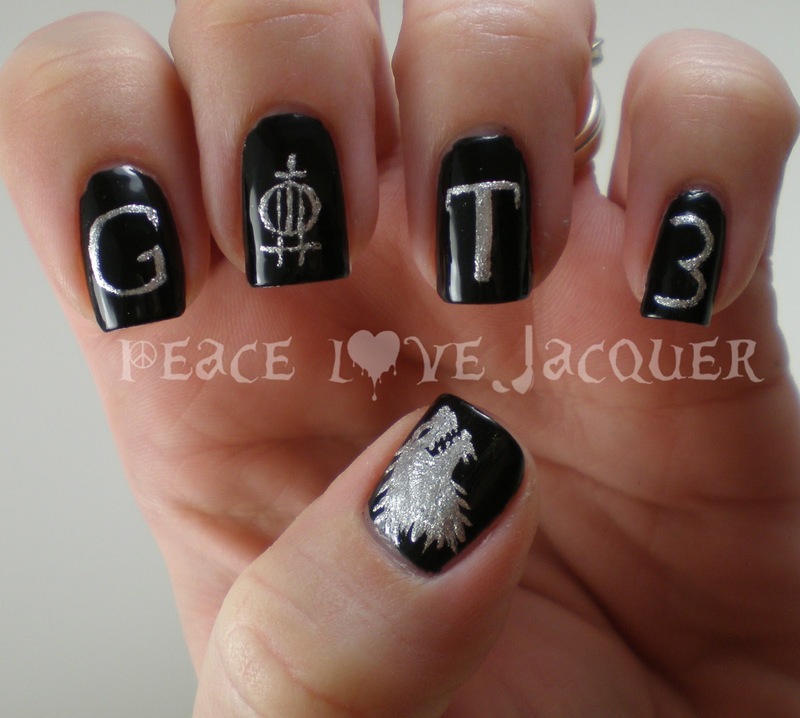 Go for TV inspired nail art– Many TV shows have inspired great nail art especially Break Bad, Game of Thrones and so on. Match your nails with your dress– If you have dresses in more or less the same or similar shades, then you can match your nails with that favorite shade. 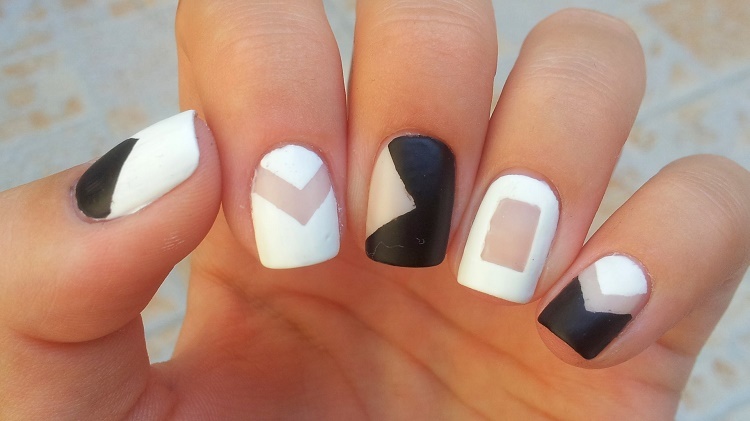 Negative space nail art– This is a popular way to decorate nails. It consists of a negative space (an unfilled and untouched portion of the nail) that gels with the other colors used in the art work. As can be seen there are hundreds of ways to decorate nails. Use a bit of imagination and the online resources given below to work your creativity and create top nail art designs.